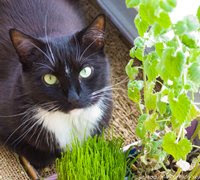 Video: How to Build an Indoor Kitty Garden. 1. Find a low-traffic, sunny spot. A view of outside is nice. 2. Add a few floor scratching posts. Add dry catnip to them. 3. Add live kitty grass. Also known as wheat grass. Water it daily. 4. Add a live cat nip plant. Pick a few fresh leaves a day and let kitty smell them. 5. Add a few toys to the kitty corner. Rest time can turn into play time! Lots of scratches, rubs and rolls make kitty happy. A hiding box or cubby hole nearby makes kitty feel safe.